Reviews of Olivenhain Guest Home for Memory Care! Assisted Living Reviews for Olivenhain Guest Home for Memory Care! I am a senior health insurance consultanat and have toured the Olivenhain Guest Home many times while meeting with clients. I have had many occasions to speak with the family of the residents regarding their "loved one's" care. I hear "rave the reviews" regarding the loving attentive staff and about the great "hands on" activities offered to the residents. This property is beautful and has a homey feeling to it even down to the mascot dog. Memory Care Reviews for Olivenhain Guest Home for Memory Care! My mother has been at Olivenhain for over 7 months. We have been with her their daily to visit and help her adjust. The staff is far beyond caring and the homelike atmosphere is so much better than the larger institutions that I have visited. The love shown by the staff for the residents is so wonderful. Even many of the caregivers who do not work there but come and provide additional companionship for individual residences have said that the personal care is so much better than many of the larger institutions. Costs for Olivenhain Guest Home for Memory Care! Photos of Olivenhain Guest Home for Memory Care! Services and Amenities of Olivenhain Guest Home for Memory Care! About Olivenhain Guest Home for Memory Care! 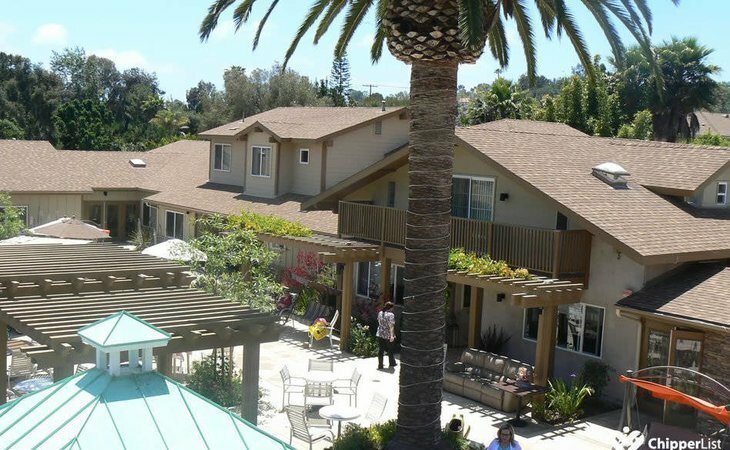 Welcome to Olivenhain Guest Home assisted living in Encinitas, CA (in North San Diego County). We are a premier memory care community. We provide assisted living services and specialize in Alzheimer’s and dementia care. These services include hospice care in a home-like setting. We are privately owned and proudly feature all inclusive rates. We don’t have a-la-carte fees like so many of the chains do. This gives you a clear understanding of what your fees will be each month, without surprises. We offer National Dementia researched activity programs to enhance alertness and physical strength, as well as live music 7 days a week and much, much more. Olivenhain Guest Home is located in Olivenhain (pronounced Oh-LEE-ven-hine) which is one of five communities in the City of Encinitas, CA. Olivenhain was settled by a German colony in the 1884. The name Olivenhain is German for “olive grove”. The German settlers built the meeting hall which still stands just a few feet away from Olivenhain Guest Home. It is used today for community functions such as the annual Oktoberfest, Haunted House, and Craft Fairs. Olivenhain stretches from San Elijo Lagoon in the south, along both sides of Manchester Avenue and Rancho Santa Fe Road, out past the northern reach of Lone Jack Road. With winding two-lane roads, rail fences, and trails for horses, bicycles, and pedestrians, Olivenhain has a rural atmosphere greatly prized by residents. The “Dark Skies” policy, which limits outdoor lighting, allows an unparalleled view of the evening sky. In 1986, Olivenhain joined with Cardiff-by-the-Sea, Leucadia, New Encinitas, and Old Encinitas to incorporate as the City of Encinitas. Why Choose Us for Alzheimer’s and Memory Care? Our newly remodeled spacious home offers spacious gardens with secured grounds. We treat every resident with dignity and respect. Providing for these basic needs on a constant basis can be an overwhelming task for family members as a loved one’s memory fails. At Olivenhain Guest Home we strive to support our Alzheimer’s and dementia residents and their families with love and respect. Thank you for your interest at Olivenhain Guest Home for Memory Care! Please give us a call to schedule a free tour. Map of Olivenhain Guest Home for Memory Care! Start your review of Olivenhain Guest Home for Memory Care! What should caregivers and potential residents know about Olivenhain Guest Home for Memory Care! ?